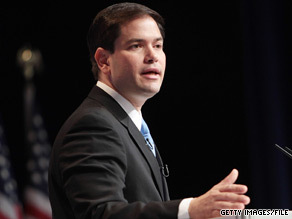 Florida Senate candidate Marco Rubio spoke out Tuesday against the Mirandization of Faisal Shahzad. Washington (CNN) - Florida Senate candidate Marco Rubio questioned Tuesday whether Faisal Shahzad, the suspect in Saturday's botched Times Square car bombing, should have been read his Miranda rights by officials following his arrest. "If this individual has information that could help us prevent future attacks and loss of life, nothing should stand in the way of that, including Miranda," Rubio told reporters in Washington, where he was visiting for a series of finance-related events. His remarks mirrored criticism by fellow Republicans like Sen. John McCain, R-Arizona, and Rep. Pete King, R-New York, both of whom said Tuesday that law enforcement officials should have interrogated the suspect before reading him the rights. Shahzad is an American citizen. FBI Deputy Director John Pistole said the suspect was questioned before and after having his Miranda rights read to him. Attorney General Eric Holder said Shahzad admitted involvement in what authorities have now labeled an attempted terrorist attack. Rubio argued that the priority for federal officials in terrorism cases should be intelligence gathering in order to prevent future attacks. Asked if Shahzad should have been read his Miranda rights, Rubio answered: "It all depends on how they are going to try him." "After 9/11, the primary goal of our war on terror has been to prevent future attacks, not just to punish terrorists, but to prevent future attacks," he said. "And part of the problem with Miranda is that it prevents you from accessing information." Why do these right wing nuts who proclaim follow the Constitution are always the same ones who are afraid to follow the Constitution when it comes to our judicial system? They only want to follow parts of constitution and only when it serves them or their viewpoint at that moment. And to all the Tea Baggers who want smaller government and less government intrusion into their lives, how many of them are members of the ACLU? They should be, but my guess would be none of them are. That simple fact alone shows that their cries for less government in nothing more than a lie. What they are really against is the President, the President who they didn't vote for. So like little immature children they cry, scream, shout because they didn't get their way. But as recent polls have shown, these Tea Baggers are the same 20% of the republican base that has always been there, just with a new name now that's all. They make a lot of noise and get press time, but they are nothing new and in no way do they represent the majority of Americans, they never did and they never will. Every single time I turn around Rubio is saying something that makes complete and total sense.... common sense.... what a concept. What is happening to the Republican Party, which is always so worried about the Constitution (except when they mess with it?) First they support random questioning of "anyone who looks illegal" in AZ, and now they want to get rid of Miranda for US citizens? For heaven's sakes, this is just stupid, not to mention dangerous. What if you were arrested? Would you not want our laws followed? Come on, stop this pandering and fear-mongering. Next you will want this guy water boarded in the name of "keeping us safe." Let the FBI do their job...they are very good at it! To misquote Palin "Americans have to be able to trust law enforcement to protect us." I do. ruby , why dont you shout the .............up you little red neck batty boy? How is it that Marco Rubio and his right wing fanatic supporters wrap themselves in the Constitution only until they need it as a door mat? Sorry, Rubio. American citizens must be read their Miranda rights. If he's not "mirandized" any evidence gained could be subject to doubt and even thrown out. So, it seems to me what they are saying is, don't mirandize him so he can't be convicted. Rubio is an idiot. The suspect is an American citizen and as such, has the right of due process of law. More pandering to the right wing knuckledraggers, Marco? He was an American Citizen. Maybe not born here, but none the less an American. We cannot just keep on making up reactionary policies of how we treat criminals. If we do, it is the terrorists who have won! The rule of law is the instrument that allows all to be equal and free, a beacon for other nations to want to become. Great! Now we're taking legal instruction from a guy who can't even use his own credit card for personal purchases. Shahzad is a Naturalized American citizen. He was questioned prior to being Mirandized under a Terror Exception to the rule. He's still providing information subsequent to being Mirandized. Marco just wants to be another pro Amnesty vote in the Senate. Go home Marco. I'm sure Jeb will give you a job in his computer or school book company. With a compliant legislature next year and a Governor who bows to Jeb, SB 6 will get through and you'll all get rich at the expense of our kids. Miranda rights hamper all investigations, but I sure would like to have them if I were accused of a crime. I think its odd that the far right wing is worried about a government takeover of our society, they are supposedly worried about the Constitution, but at the same time advocate getting rid of Miranda rights. The issue is protecting the rights of people to be sure they are not falsely accused. Rubio is nothing but a tool............. of the right wing. So what Rubo is saying is that a US citizen when arrested shoud not be read his rights? Hmm thats a bit totalitarian dont you think? Perhaps if Rubio were arrested for drinking and driving the police should feel empowered to beat a confession out of him. We have so many constitutional rights that we should just ignore when it suits us dont you think?